(1) Vix. The S&P 500 VIX fell to a record low 9.36 last Friday. It had spiked to 28.14 early in 2016 on fears of four Fed rate hikes that year. The Brexit scare last summer caused it to spike to 25.76. 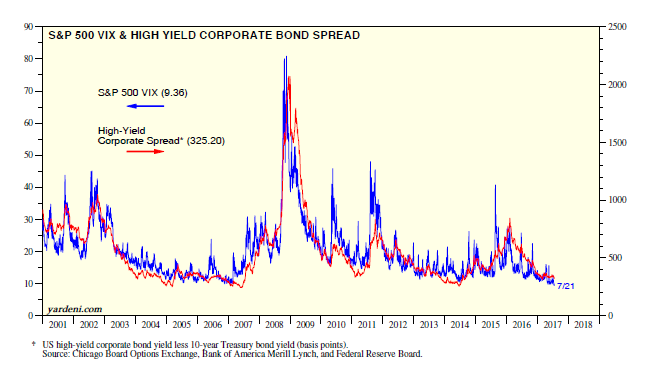 (2) High-yield spread. The yield spread between the high-yield corporate bond composite and the US Treasury 10-year bond remains extremely low around 325bps despite the recent weakness in the price of oil. That spread widened dramatically from 253 bps on June 23, 2014 to 844 bps on February 11, 2016, when the price of oil plunged. Not surprisingly, the spread is highly correlated with the VIX. Both suggest that investors are enjoying a summertime siesta. (3) Sentiment. So does the Investors Intelligence survey, which shows that only 16.7% of investment advisers are bearish. 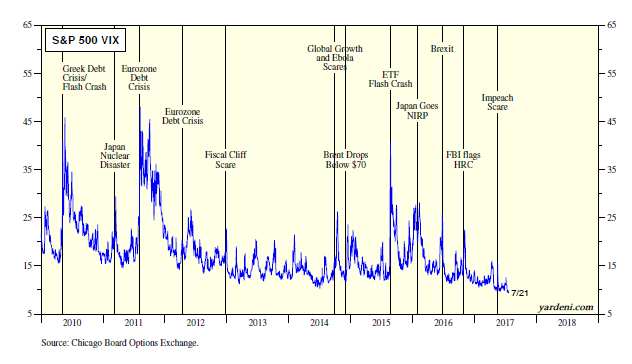 This series is also highly correlated with the VIX. The Bull/Bear Ratio was back above 3.00 last week. 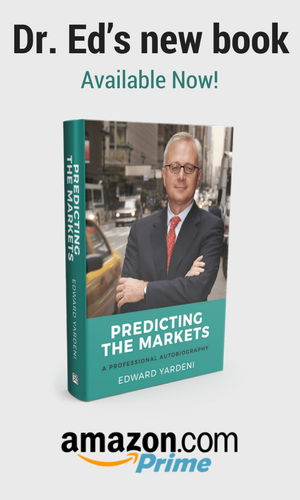 The consensus scenario that seems to be lulling everyone to sleep this summer is as follows: The economy will continue to grow at a leisurely pace, with real GDP rising 2.0% and inflation remaining just below 2.0%. This is certainly not a boom, which therefore reduces the risk of a bust. No boom, no bust (NBx2)! So the economic expansion could last for a long while. Back in 2014, I explained why it might last until March 2019. It will be the longest expansion on record if it lasts until July 2019. Everyone has plenty of explanations for why wage inflation hasn’t rebounded and might remain subdued while the unemployment rate is so low and might stay that way. The Fed should continue to raise rates, but monetary normalization will remain very gradual, and the federal funds rate might peak at only 2.00% this cycle. I am officially dubbing this the “2-by-2-by-2” scenario, with real GDP growing 2.0%, inflation at 2.0%, and the federal funds rate at 2.00%. This is the consensus currently, in my opinion, based on my discussions with some of our accounts, most recently in the Mid-Atlantic states. China’s real GDP rose 6.9% y/y during Q2. During the quarter, it rose 6.7% (saar), which it’s been hovering around since the end of 2013. That’s a slowdown from the 10%-plus pace that was the norm in the years prior to the global financial crisis of 2008 and for a couple of years afterwards. Nevertheless, China’s growth rate is impressive compared to those in most other countries in the world. Even more impressive is how much credit it is taking to prop up China’s growth. Of course, this isn’t impressive in a positive way, since economic growth financed by excessive debt often ends badly. (1) Social financing. Total social financing over the past 12 months through June rose by a record 19.2 trillion yuan, or a near-record US$2.8 trillion. It has been on a tear since the Chinese government pumped up the economy in response to the financial crisis of 2008. The country has become increasingly addicted to debt, and can’t seem to break the habit despite government officials’ previous assurances that will happen. It hasn’t happened so far because the government hasn’t figured out any other way (such as free-market capitalism) to boost growth. Since Premier Xi Jinping assumed command during November 2012, social financing has totaled a whopping $11.2 trillion, with bank loans up $6.4 trillion! (2) Bank loans & M2. Bank loans are the largest component of social financing. Over the past 12 months through June, they rose by a record 13.2 yuan, or a record US$1.9 trillion. Astonishingly, bank loans have more than tripled since the end of 2008, soaring by 280% to a record $16.8 trillion during June. The good news—I guess—is that all of this bank debt has been financed entirely by an increase in M2. So the Chinese owe it to themselves, similar to what has been happening in Japan for many years. (3) Shadow banking system. Also mildly encouraging—I guess—is that the authorities seem to be making a bit of progress throttling back the shadow banking system. I estimate shadow banking activity by subtracting bank lending from total social financing. Doing so suggests that on a 12-month basis, the shadow banks accounted for a record 55.1% of social financing through May 2013. That percentage fell to a recent low of 25.1% through July 2016. It was back up to 31.3% in June of this year. (4) Industrial production & trade. Just for fun, I compare the growth rates of China’s bank loans to industrial production and track the ratio of the former to the latter. The ratio of bank loans to industrial production confirms my concerns about China’s increasingly debt-financed growth. All that debt seems to be having a decreasing impact on boosting economic growth. The ratio was relatively stable around 100 from 2000-2008. Since then, it has risen sharply and persistently to a record 170 during June. The Chinese seem to be getting less and less output bang per yuan. The good news is that China’s trade data (in yuan) has improved significantly since early last year, with both exports and imports near record highs in June. The y/y growth rates for these categories were strong at 16.9% and 22.6%. The exports data suggest that the global economy is growing solidly, though some of that may be due to the stimulus provided indirectly by China’s ongoing borrowing binge. (5) Demographics. Weighing on China’s growth rate is its geriatric demographic profile. The country’s fertility rate dropped below the replacement rate of 2.1 children per woman during 1995, and is expected to remain below that level through the end of the century, according to UN projections. The growth rate of the population is projected to turn negative during 2033. The growth rate of the working-age population (WAP) already turned negative during 2016 and is expected to remain so through the end of the century—with WAP falling to 558 million from a peak of 1,015 million during 2015. The latest ascent into record-high territory for the S&P 500, with historically high P/Es, naturally has raised fears of a correction, or worse. It seems to me that the market is doing a very good job of correcting internally on a regular basis without giving up the high ground. The latest example is the recent selloff in technology stocks and rebound in financial ones. That might continue without triggering a market-wide selloff. (1) My Boom-Bust Barometer (BBB) is simply the ratio of the CRB raw industrials spot price index and weekly initial unemployment claims. It remains in record-high territory, with a whopping y/y gain of 21%. (2) My Fundamental Stock Market Indicator (FSMI) averages the BBB and the Bloomberg weekly Consumer Comfort Index. FSMI tracks the S&P 500 even better than my BBB. It is also up in record territory, with a gain of 13% y/y. (3) Forward earnings. Both measures have been highly correlated with the S&P 500 since 2000. That’s because both have been highly correlated with the forward earnings of the S&P 500, which rose to yet another record high during the 6/29 week. S&P 500 operating earnings totaled $958 billion over the past four quarters through Q1-2017, with buybacks and dividends accounting for 95% of this total. The dividend payout ratio of the S&P 500 remains around 50%. This implies that corporations are spending all their extra cash on buybacks rather than capital spending and wages. (1) Sources of cash. NFCs had reported pre-tax profits of $1,271 billion. They paid $322 billion in taxes and $617 billion in dividends. They had $1,307 billion in capital consumption allowances (CCA). Their internal cash flow, i.e., the sum of their retained earnings and CCA, was $1,639 billion. Their net bond issuance was $268 billion. These sources of cash sum to $1,907 billion. (2) Uses of cash. Capital expenditures (including inventory investment) totaled $1,670 billion last year. Buybacks totaled $586 billion. These two categories of spending sum to $2,256 billion. The discrepancy between the sources and uses of cash seems large, but it tends to average out over time. Besides, the analysis above excludes lots of other items in the Fed’s accounting for this sector. The main point is that cash flow is much bigger than after-tax profits less dividends. Companies have been spending plenty on capex, including on technology, which is cheaper and more powerful than ever.